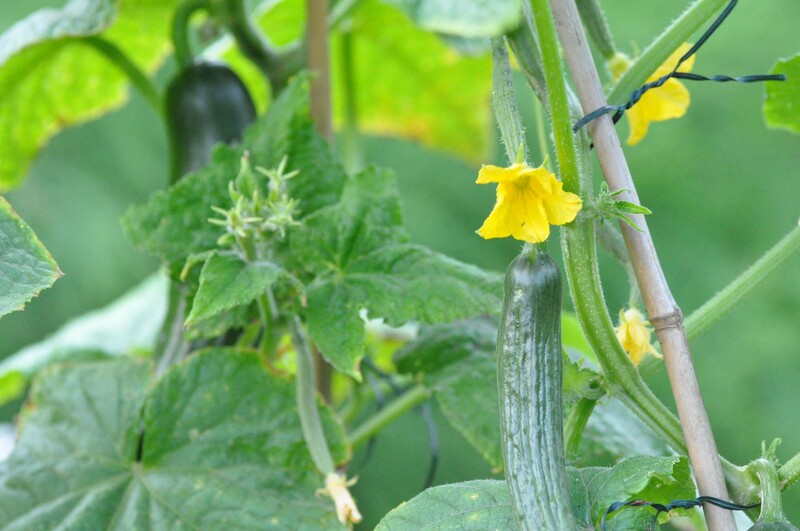 this year or better to say last year we have been very successful in growing courgettes, carrots and cucumbers. while courgette and carrots are no big thing – the dozens of cucumbers we harvested are a kind of 7th world wonder in our garden. all the past years we had only one or two cucumbers. that’s it. during the whole summer one or two cucumbers. what did we change this year? something very simple and for sure obvious for every experienced gardener. we built something to allow the cucumbers to rank. all the years we led them grow on the ground, the poor things. this year we constructed a kind of tent with bamboo sticks and fixed the cucumbers to help them to rank. so simple, such an amazing result. we had more cucumbers than we could eat. the kids ate them pure, we had summer rolls, glazed salmon with cucumber salad, asian carrot and cucumber salad a la green papaya and i don’t know what else. there are a lot of cucumber post to write and to look forward to the next season! This entry was posted in gardening, summer and tagged cucumber by The Cook. Bookmark the permalink.